Americans don't read - that's been a repeat criticism to a country obsessed with screens and media since the days of the silent film. Yeah, because they listen... to audiobooks. While it's true that Americans don't read as much as other nations, they are consuming a lot of titles in the car, on the go, and at home as audiobooks while doing other stuff - Americans have some of the longest commuting times in the world, you know. Google has taken notice of the never-ending popularity of read-out-loud books, and started offering them through the Play store yesterday, with a lot of titles at discount to lure a critical mass of subscribers away from Amazon, which has been offering audio versions since its first days as a humble online book shop. They are in the Books section, and available in 45 countries and nine languages. 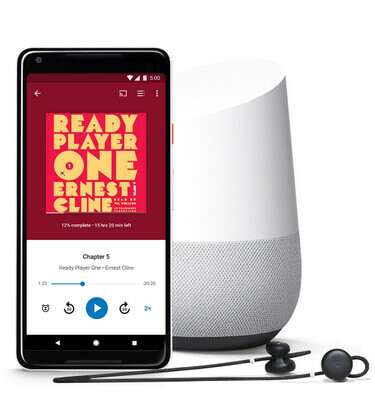 There is one more reason Google is outing audiobooks at the Play store now - its growing cohort of smart speakers is the perfect venue for consuming this type of content, and a lot of people have been complaining that they have to get the audiobook from a third-party vendor, then fumble to stream it to Google Home while cooking, for instance. 2. Say "OK, Google, read my book" to start listening from your smart speaker, or, if you have purchased several titles, say "OK, Google, read [book title]." "OK, Google, how much time is left?" "OK, Google, who wrote this? 5. If you want another device to take over the reading duties from the Google Home speaker(s), you can simply say "OK, Google, read my book on [Chromecast name]," and that's that.